George Ruzhev was born in 1964 in Sofia. He is a media artist based in Sofia. Graduates from the National School for Photography in his work He is looking for the specific show, influencing all the senses. He presents his projects in series of shows above and under the level of the usual; they are only a little element of the entire illusion of the endlessness. His works consists of shows, including music, created by himself, animated projections, 16 mm movies, holograms, mega prints and light design. 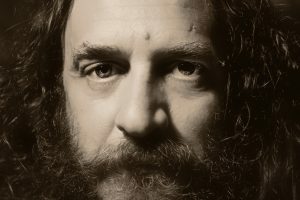 His recent works have investigated the relationship of the individual – including historical and religious.Since 1992 works consecutively, with the different groups – “TOCXIC ANTIE”, “THE SOP OF THE STRIX BUBO”, SUBSCRIBE”, “OVERMIX”, “ Sofia – Night Club”, “OCTOBERON”, “DUMMY Co. group”.His artistic projects have been shown in art spaces like Yerbatan Saranicu – Istanbul, Turkey; Shugar Factory – Amstrerdam, Netherlands; The Horse Hospital Gallery , London, UK, National Gallery, European Parliament – Brussels, Belgium; Sofia Arsenal – Museum of Contemporary Art, Institute of Contemporary Art, Gallery XXL, Gallery “KA” – Bulgaria and other.Take a part in art forums such as 7th International Media Art Biennale “The Power of tape” – Poland; All Yearly Exhibitions Of The Center for Arts, “Soros”, Sofia, Bulgaria; “Bienod Belief, Contemporary from East Central Europa” –Museum of Contemporary Art, Chicago, USA; 3rd Intepnational Istanbul Biennial , Karl Drerup Gallery, Plimout stsite college “Works on paper from Bulgaria” – Istanbul, Turkey; 2-emme Biennale International pour la Photographie d’Art et de Recherche, Paris, France ; “Art of today” – Budapest, Hungary; National Biennale for Photography – Sofia, Bulgaria and other. “I am not talking neither do I mean “art”, because the art is only a separate case. Everything is related with the way life is divided in order and chaos as a very important negative –positive polarization/which is identification with aliens/. All that included in the conventional chaos with one and only goal – to destroy the thin levels called “consciousness” and “culture”.